What do you expect from a music phone? With its 5730 XpressMusic, the latest addition to Nokia's music-centric portfolio, a slide out QWERTY keyboard is slipped into the mix, as Nokia makes a play for the music fan who wants some heavyweight messaging muscle to go with top-of-the-bill tune-playing. While some of Nokia's earlier XpressMusic models were trim with a few music controls but light on high-end gadgetry, the 5730 is a chunky candybar that crams in plenty of tech stuff. 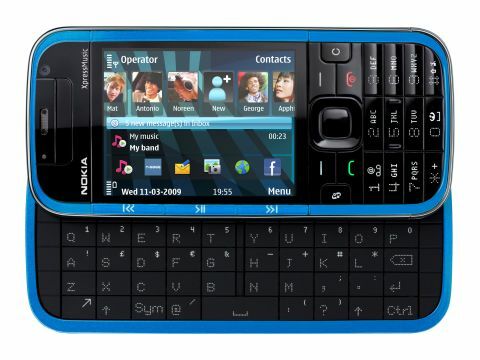 It runs on the non-touchscreen Symbian S60 3rd Edition smartphone platform, packs HSDPA high speed mobile data connectivity and Wi-Fi, and includes A-GPS satellite positioning inside. An 8GB MicroSD memory card is supplied in-box too. Its QWERTY keyboard is in place to handle a multitude of text messaging, email, and instant messaging duties, and for a bit of online social networking and internet browsing. Its typical S60 multimedia capabilities are supplemented by a 3.2-megapixel camera, sporting a Carl Zeiss Tessar lens. The Nokia 5730 XpressMusic debuts at a SIM-only price of £289 – sticking it in a higher mid-tier bracket. In some markets it'll also be offered as one of Nokia's Comes With Music devices, with unlimited downloads for a premium on that price. So can this hybrid messaging-meets-music mobile really strike the right notes with the music mobile buying audience?